Mr Khazim is wonderfully dedicated and professional. I had a neck, shoulder and arm pain which he diagnosed to a compressed nerve in my lower neck. A few weeks later and I was recovering [and] no more pain... Thank you so very much Mr Khazim and your wonderful staff. Dear Mr Khazim, thank you so much for all your kindness and care. I appreciate the surgery you so brilliantly performed and cannot believe the difference it has made!! Fantastic – almost magical! You, together with your team, is one we should all be very thankful to have. To Mr Khazim and team, thank you so much for the amazing operation and care I received. It is truly amazing not to be in horrible pain! After a serious accident and breaking my neck, I was scared for the future and what lay ahead. Mr Khazim walked into my world, with his care and skills in surgery put me at ease and restored my life as it was prior to my accident. 9 weeks later I was back at work and living a normal family life. I put my care in the hands of Mr Khazim and would highly recommend him to anyone who wants the best care they could ask for. For many years I suffered chronic low back pain and sciatica until I was unable to stand around or walk even for short periods of time and this severely curtailed my ability to lead a normal life. I saw Mr Khazim and after much consultation about my options I elected for him to operate. The surgery was a tremendous success and I haven’t looked back since. 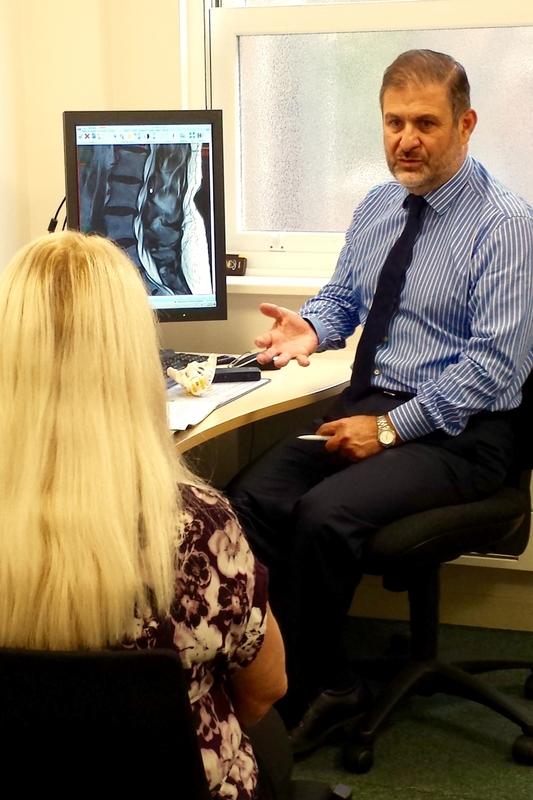 I would have no hesitation in wholeheartedly recommending Mr Khazim to anyone with a back problem – his personal approach, care and skill as a surgeon literally gave me a new lease of life. It has made the world of difference to me and I will always be in his debt.